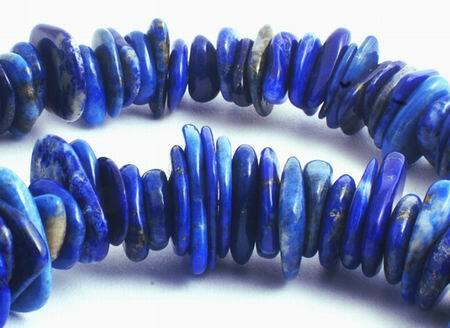 Sorry, we are currently sold out of 'Wonderful Deep Blue Lapis Slate Chip Beads'. Please check back later. Price is per 16-inch strand of these beautiful beads. All different sizes, range from 14mm x 11mm x 2mm to 10mm x 7mm x 3mm - many in strand. lapis lazuli. Through the ages, lapis has been associated with power, wisdom, love, and a stimulant for psychic ability. And in the art world it¿s famous for the ultramarine blue paint used by the Grand Old Masters, like on portraits of the Virgin Mary. While other compositions have long since paled, lapis has lost nothing of its brilliance.